Tonight Huntsville Vegans held an educational outreach event on the University of Alabama in Huntsville campus. Each student received an information packet that contained a vegetarian starter kit, a Farm to Fridge dvd, and resources on health and nutrition. We had three speakers at this event. Melissa Baker encouraged students to pursue careers in vegan business. She emphasized that this is a growing market, and that as more people become ethical consumers they will begin looking at labels and tags to see if it is vegan and cruelty-free. Lucy spoke to students about the environmental impact of factory farming. She pointed out the amount of water needed to create a pound of vegetables and the amount of water needed to create a pound of meat. The difference was staggering – 10 gallons of water to create a pound of vegetables, versus 5,000 gallons of water for a pound of meat. Our last speaker was Peter Young, who brought the horrors of the slaughterhouse close to home with his descriptions of the factory farming process. 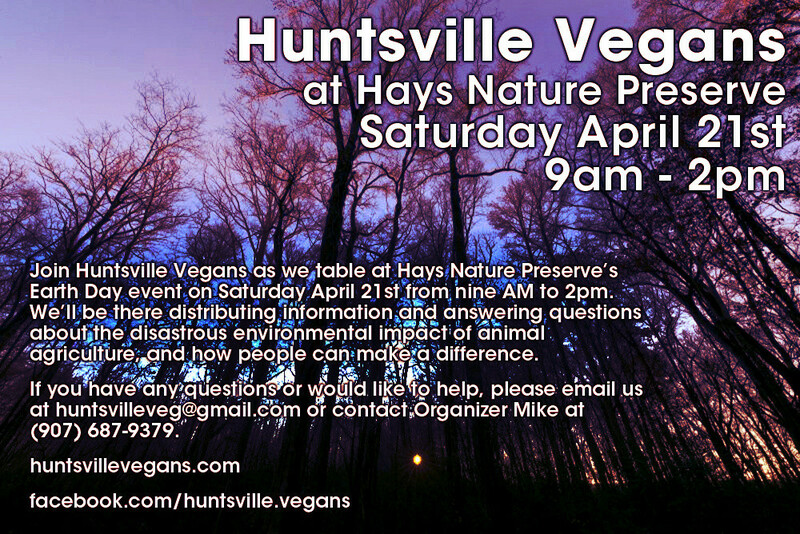 At the end of the event there was a brief Q&A, followed by drawings for door prizes that included vegan chocolate chip cookies, PETA’s College Cookbook, a Fowl Play dvd, Comfortably Unaware, and Huntsville Vegans t-shirts. We would like to thank Tiffany Webb for inviting us to speak to the UAH students, for providing vegan snacks and drinks, and for going out of her way to make sure we had everything we needed. The best news is that several students have told us they are going vegetarian as a result of this event! We’re excited that a new generation is considering a lifestyle that has enormous positive effects for their health, the environment, and of course, the lives of animals. If you are a UAH student and are interested in learning more about a vegan lifestyle, visit the Facebook event page for the upcoming UAH Vegan Club Interest Meeting. This week we’re putting on two educational events. 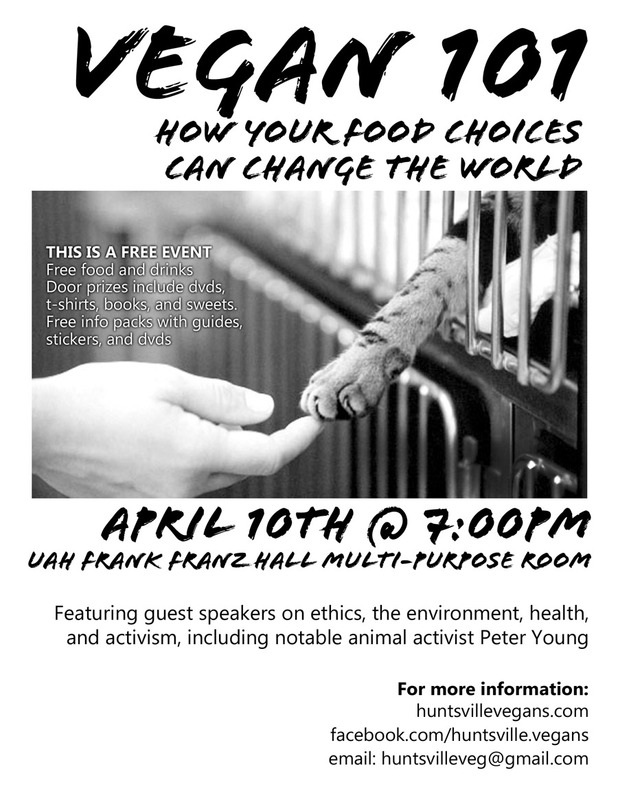 Huntsville Vegans is hosting a special event at UAH for students and non-students alike – Vegan 101: How Your Food Choices Can Change The World. THIS IS A FREE EVENT. We’ll have four guest speakers discussing ethics, the environment, health (with a short cooking demo), and activism (including notable animal activist Peter Young). We’ll also have free food and drinks, door prizes including dvds, t-shirts, books, and sweets. We’ll also be giving everyone an info pack with guides, stickers, and dvds. For more information, visit the Facebook event page or the Meetup event page. Huntsville Vegans is hosting another free monthly movie night/food sharing on Thursday, April 12th, with a screening of The Milk Documentary (2011). Our monthly movie nights take place on the second Thursday of each month at the Huntsville Public Library (in the auditorium on the ground floor) in Downtown Huntsville. Doors open at six, and we’ll start the movie around 6:30. “Got the facts on Milk? (also known as “The Milk Documentary”) is an entertaining, award-winning feature documentary that dares to question the conventional wisdom of the much publicized health benefits of milk and dairy products. Addressing myth, truth and all in-between, the film is a humorous yet shocking exposition that provokes serious thought about this everyday staple. The dairy industry has faced multiple clashes in recent years bringing it to an all-time high in questionability. In 2007 the U.S federal trade Association demanded the dairy industry’s weight loss campaign be pulled, due to unsubstantial evidence. The Monsanto Corporation pressures the FDA to ban labeling milk ‘rBGH free’. The rise in antibiotic drug residues found in milk and the recent approval of cloning cows for human consumption has today’s consumer apprehensive. We’ve got two fun events coming up this week! The first is a tabling and outreach event at Earth Fare this Saturday from Noon – 2:00PM. 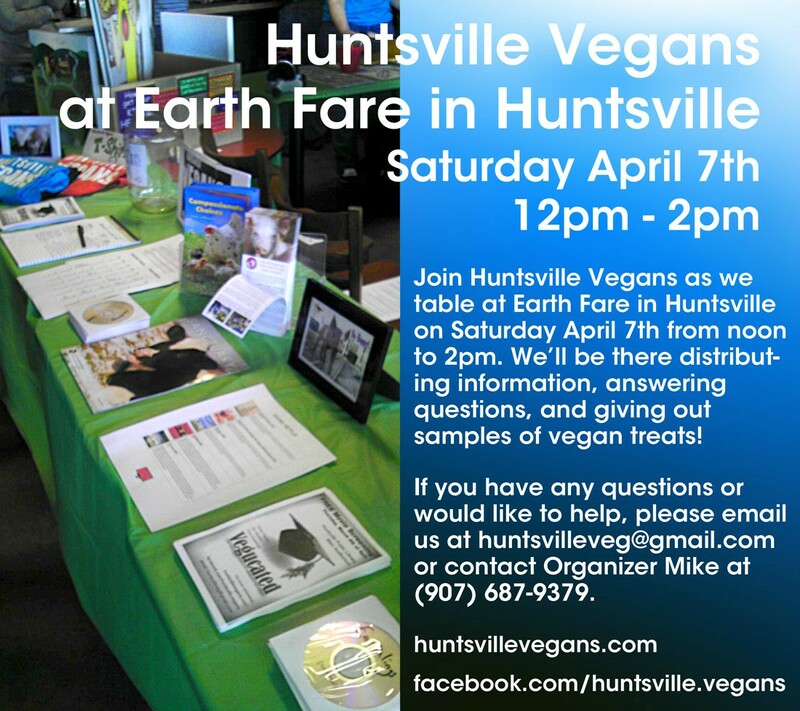 We’ll have free information and will be available to answer questions about going vegan. If you’ve been wanting to come to one of our events, this is a great opportunity to meet us and find out more about our group. The second event is our monthly potluck. Potlucks are a great chance to try new foods and learn new recipes! We ask that everyone bring a vegan dish to feed 8 people, so that we’ll have plenty of food to go around. If you’re not sure what to bring, it’s always a safe bet to bring fresh veggies and fruit, or a pre-made dish from Earth Fare that has the happy yellow Vegan tag! If you’re really stuck about what to bring, feel free to email us at huntsvilleveg@gmail.com for ideas. 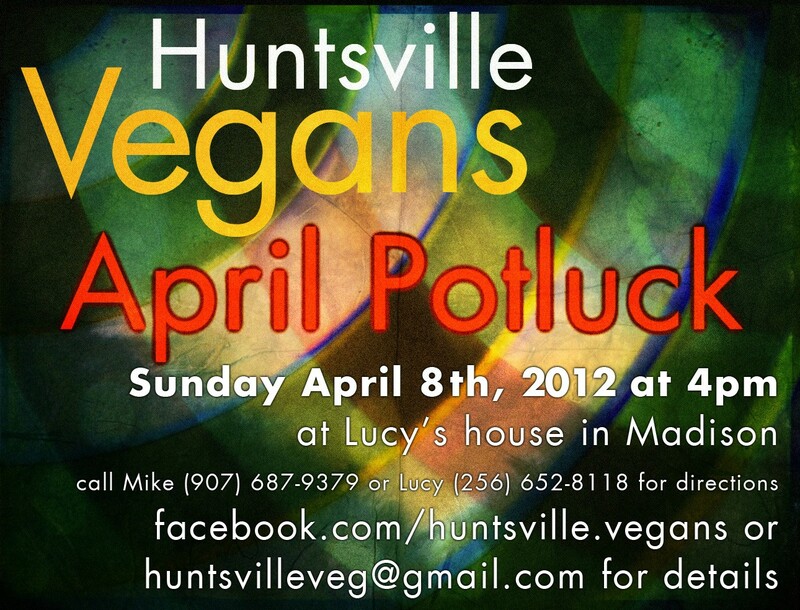 This potluck is at Lucy’s house in Madison. Please email us or call us at 907-687-9379 for directions.